Welcome to ACQUISITION Games. 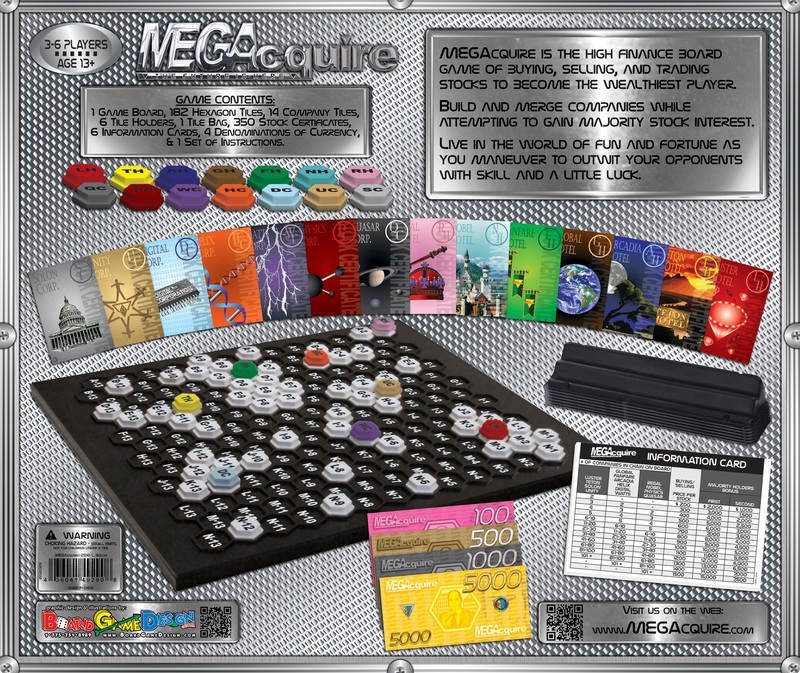 The 500 MEGAcquire games have become history with thousands of true ACQUIRE fans being able to experience the excitement of an expanded and enhanced game experience. The ACQUISITION Games website is still your source for Vintage ACQUIRE game parts and Vintage ACQUIRE Games and enhancements. After two attempts to reproduce MEGAcquire in the form of MEGAcquisitions, it has been decided to change direction and produce the game of ACQUISITIONS. It will be an exciting new adventure for the ACQUIRE fan. 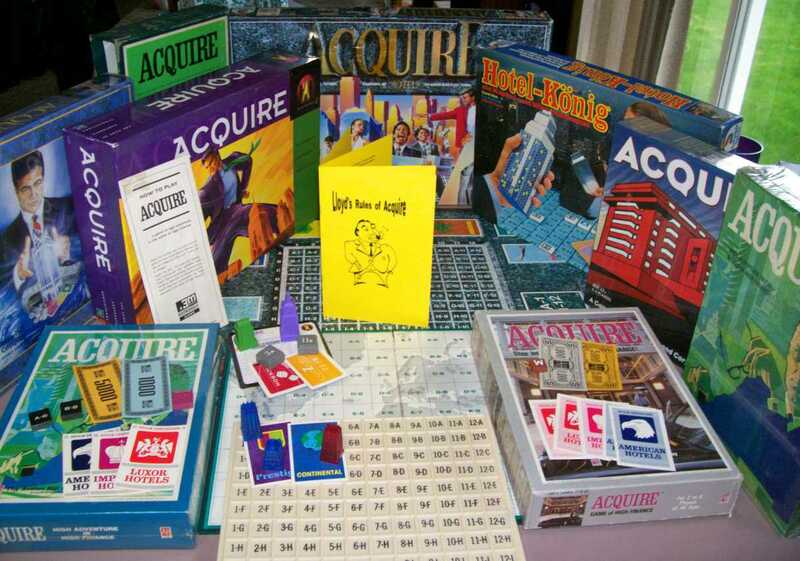 The Acquisition Games website offers a multitude of information concerning the game of ACQUIRE. You will find a complete history of the game that is made up of separate pages for each era of the game. There are the beginning stages of the 3M Era, followed by the next stage that is the Avalon Hill Era, and finally, the current stage that is the Hasbro Era. You will also find pages about the international editions of ACQUIRE, which is very popular in Germany. There is a separate page about the German versions, as well as a special page with information on ACQUIRE '97, also known as the "Holy Grail of ACQUIRE." Sid Sackson, the creator of ACQUIRE, was obsessed with improving on games he had received from his mother. When he was a young boy, he would receive a new game from her every week. He took a game called, Lotto, and turned it into a solitaire game of empires. 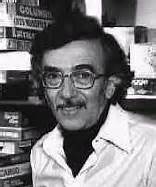 Subsequently, he took the solitaire game of Lotto that he had created, and turned it into a multi-player game he called, Vacation - The Game of Hotels, which was purchased by the 3M company who changed the name to ACQUIRE. Sackson understood that his inspirations for designing a game were simplistic; he would just build upon things that he found interesting. His friend, Derek Carver of England, told me, "If he saw a design of somebody else's that embodied interesting ideas that he thought he might use, out would come his notebook, and the details would be recorded." Sackson considered ACQUIRE his best and most successful creation, and through the work of the Acquisition Games website, I am proudly promoting the game of ACQUIRE while carrying on his tradition by simply building on his best creation and making the results available for anybody who is interested. I offer replacement parts for vintage ACQUIRE games so you can fix your old game and continue to enjoy many more years of your treasured classic. 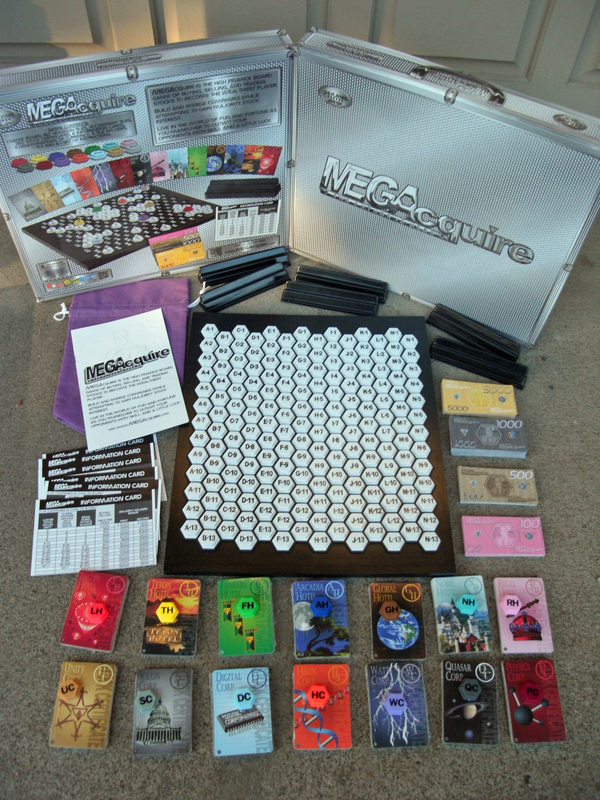 I have developed enhancements for the game of ACQUIRE, including the largest variant of them all, the game of MEGAcquire. 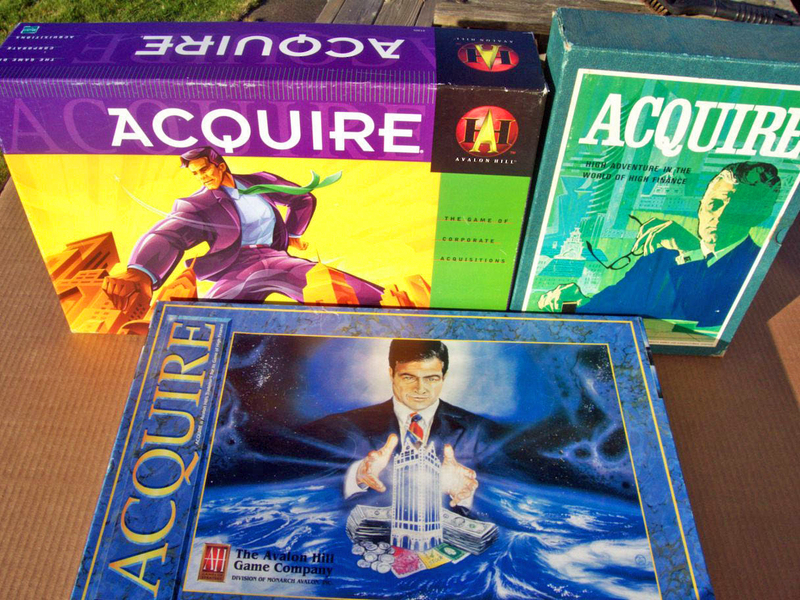 I am attempting to take the game of ACQUIRE to levels that add intrigue for the longtime ACQUIRE fan, while at the same time, broadening their game experience. While working towards this goal, the most astonishing fact I learned was that the game of ACQUIRE, (actually Vacation,) was played differently in its original form. By creating the 1963 World Map Conversion Kit, I can offer players the ability to recreate those original Sid Sackson rules, before they were drastically altered by the 3M company, within their own edition of ACQUIRE, whether you own a 3M, Avalon Hill or 1999 Hasbro edition. 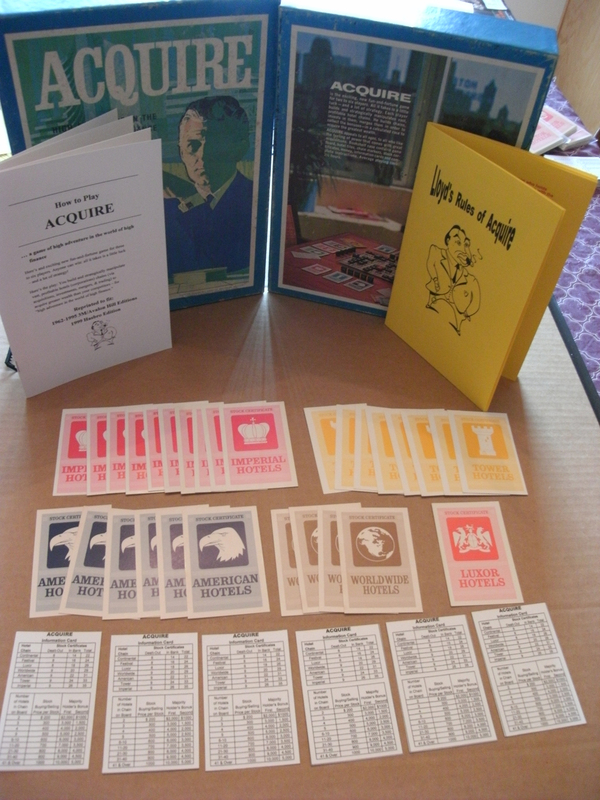 The 1963 World Map Conversion Kit is also available for the game of MEGAcquire. The Special Powers Variants appeared in the 1993 Schmidt Spiel German edition, and then were subsequently used in the 1995 Avalon Hill edition. 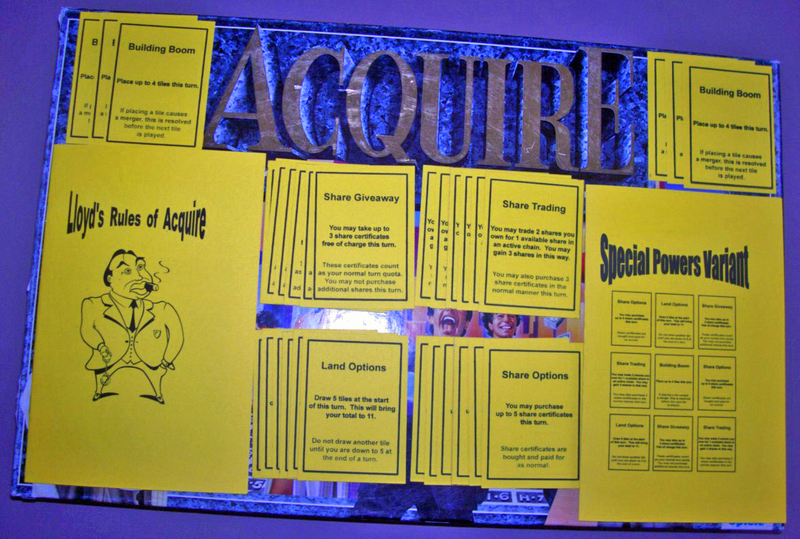 I have created a Special Powers Variants Kit that can be used in all versions of ACQUIRE. The Wild Tile was an idea envisioned by Allan Wright of New Hampshire. I used his idea and created the Wild Tile Kit. It is a variant of the game of ACQUIRE that allows each player to have one blank tile that they can play any time during the game when it is their turn. It guarantees that each player will have that one "perfect" peg. 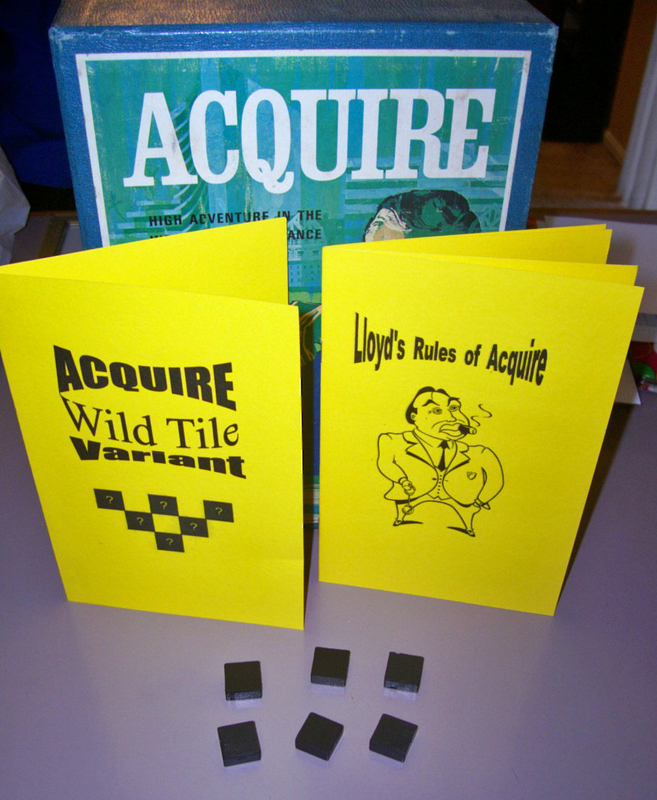 The Wild Tile Kit is available to fit the 3M wood tile edition, both the 3M and Avalon Hill plastic tile editions, and the 1999 Hasbro edition of ACQUIRE. This kit is also available for the game of MEGAcquire.